My grandmother was christened in St. Paul’s Episcopal Church in Augusta, Ga. Her funeral was held there, too, just over 100 years later. For more than a century, she belonged to the same church. That probably sounds like the pinnacle of spiritual stability, and it’s true that Grandmother’s faith in Jesus never faltered. It is also true, however, that she sometimes had a rocky relationship with her church. Born in 1908 and raised on a daily dose of the King James Bible, my grandmother didn’t take kindly to some of the changes that modern thinking brought. More than once she threatened to never set foot inside St. Paul’s again. She always made her peace with the church, though, and ultimately was sent to her rest by a woman in the pulpit, one of the changes she had trouble accepting. Isy Clary Brooks is preparing to celebrate his 100th birthday and a century of devotion to the Methodist Church. 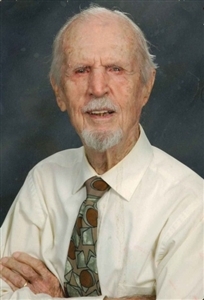 So I was intrigued when Lonnie Brooks, a onetime Florida Methodist who now lives in Alaska, wrote that his Uncle Clary, a lifelong Methodist, was going to celebrate his 100th birthday on Sept. 28. Family members from as far away as The Netherlands are planning to attend a reception for Clary Brooks after worship Sept. 30 at First UMC, DeLand. What had he seen in his long life? How had the church changed? Had he struggled with his faith? What was his secret to longevity? Less than three weeks before the big event, I talked with the centenarian-to-be, who lives in DeLand near his oldest daughter, Lorna Jean Hagstrom. He stays busy every day in his wood-working shop. His mind is so sharp he still remembers the number of steps (17) sloping down from the foyer to the pulpit in his childhood church in Bowling Green, Fla. He remembers the numbers (155100) on a ticket that won his family a Model T Ford in an auto dealership drawing during the hardscrabble years of the Great Depression. He was 12 at the time and had written down all the numbers from tickets his dad had collected, so as not to miss the winning number when it was called. Isy Clary Brooks is one of 10 children born to devout Methodists in a rural part of southern Georgia. His father, a cotton farmer, and his mother’s brother, a sawmill owner, helped build the first Methodist church in the community, a small wood-frame affair with a steeple, before he was born. One of his first memories is as a toddler dozing off in the church, which was lit with kerosene lanterns. When he was about 10, the cotton crop failed. The family had kin in Bowling Green, so they packed the wagon with meat and flour, hitched it to two mules and headed to Florida. Times were hard, even before the Depression settled in. The family moved into a ramshackle house where young Brooks could see dirt through the cracks in the wood floor by day and watch moonlight pour through the holes in the tin roof at night. In winter, the whole family had to rely on a single fireplace in one room for heat. His dad leased a large piece of land and planted tomatoes and other vegetables. Then times got even harder. Brooks says the family lived largely on their own crops, sometimes swapping turnip greens for flour, sugar or coffee. His father cut and sold firewood to bring in some money. Tent revivals drew hundreds of followers, and Brooks remembers a particularly popular evangelist. The family drove to see him in the new Model T.
“I didn’t get there in time to get a seat. … People were standing around on the edge, probably 10 people deep. Brooks joined the church choir at age 13 and quickly developed a reputation as a sweet-tone tenor. Later, he and his brothers and a friend who sang bass formed a gospel quartet and made the rounds of local churches. Brooks would go on to sing in Methodist church choirs for more than 50 years. His singing voice landed him a job in radio in Orlando in 1936, but his $50 monthly salary barely stretched enough to cover his rent, meals and dry-cleaning. So he accepted a job in furniture sales that paid him twice as much. World War II called in 1944, and when Brooks returned, he went back to the furniture business, where he remained until retiring in 1978. Brooks says he has tithed all his life, and he believes the Lord has rewarded him. He was married to the former Ethel Barker for 54 years before her death in 2005, and the two had a home in St. Cloud and a summer house in North Carolina. When her father died, he left an inheritance that, when invested, has provided amply for his 34 post-retirement years. He has three children, all Methodists. Brooks has few complaints about the church he grew up in. It was Methodist Episcopal when he was born, he notes, and the merger that led to the United Methodist denomination caused a small ripple of dissension when new hymn books were introduced. The compromise was to sing songs from both the new and old hymnals. His hymns of choice are “In the Garden” and “Wonderful in the Heaven Jesus,” which will be played at his centennial birthday celebration. Today his only gripes are the contemporary-style service – “Can’t stand it. I like my music to sound good. I don’t like it to sound loud” – and the disappearance of Sunday evening services. Brooks is convinced a Sunday evening service is needed for those who can’t get to church in the morning. His secrets for a long life?